Soon I'll be whooshing through the atmosphere in the direction of fun. As long as I'm able to tap into Czech telecommunications, I should be back here on Monday. 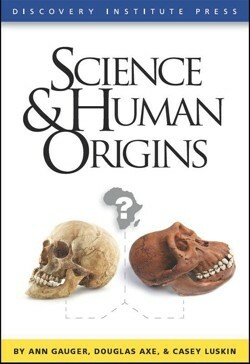 Human Origins and the Fossil Record: What Does the Evidence Say? Hominin fossils generally fall into one of two groups: ape-like species and human-like species, with a large, unbridged gap between them. Despite the hype promoted by many evolutionary paleoanthropologists, the fragmented hominin fossil record does not document the evolution of humans from ape-like precursors. I know that it's like shooting geese in a swimming pool, but I have to take him at his word, and I'm compelled to deconstruct his thesis to show it for the straw man that it is. Luskin's thesis can never recover from his first statement, which contrasts what he calls ape-like and human-like. Such a false dichotomy side-steps, charlatan-like, the issue of how 'ape-like' both apes and humans are. Even if one were to ignore all of the genetic and morphological differences between primates and the other mammals, and even if one were to ignore the evidence for the unmistakable relatedness of the higher primates (and it's a prodigious trait list), there still remains a formidable corpus of traits that we humans share, one-to-one, with the other apes, and which give lie to Luskin's main premise. For example, in the Order Primata the apes exhibit the autapomorphic absence of a tail. I can't imagine Luskin having an explanation for the preponderance of tails among mammalian groups and the absence thereof among the extant apes and their closely related fossil precursors. But it's easy to see that we humans don't have a tail because we share a close common ancestor with the other apes--no other explanation is possible [unless Luskin were to argue that God thought it was a good idea to deprive chimps and gorillas of tails, too, when he was intelligently designing His special creations, humans]. Dentally, compared with all of the other dentate animals, the apes possess adult teeth according to this pattern: 4 upper and 4 lower incisors, 2 upper and 2 lower canines (or cuspids, to the dentists), 4 upper and 4 lower premolars (or bicuspids to the dentists) and 6 upper and 6 lower molars. Moreover, apes, which includes all of the fossils that Luskin would term ape-like, have a 5-cusped third molar. This is why its so easy for us to identify fossil apes from even individual teeth, because of the unique morphology of ape molars. It is, then, utterly pointless for Luskin to point to anything called ape-like as distinct from anything human-like, for both groups are, demonstrably and unequivocally apes. And, if Luskin is happy to conclude that 'human-like' fossils are the result of God's intelligent design, then he'd have to conclude equally that God was designing the other apes along the same lines. I doubt very much that Luskin could explain the similarities amongst the apes as a function of intelligent design, any more than he can logically conclude that humans were the result of a different, more intelligent, supernatural design. I could go on. But I think it would get redundant. Hit these bastards where it hurts the most. Confront them with the truths they refuse to see. I hope I've made it a little easier today. Have a safe trip, and best of luck with the excavations! I'm leaving for the radiocarbon conference in Paris in a few hours. I have a window seat so I'll wave to you when we cross paths over the Atlantic.